Medications during Pregnancy: What Is Safe and What Isn't? We take a look at which medications are safe to use during pregnancy and which are not. Because the majority of women will become sick at some point during their pregnancy, many women are curious about the safety of medications during pregnancy. While no medication has been proven to be completely safe for the developing fetus, several medications have been approved for use during pregnancy by medical professionals. 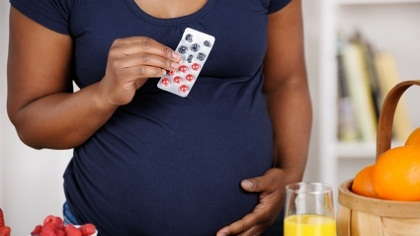 It is very important that all medications, even if approved for use during pregnancy, be taken as instructed by the doctor or as indicated on the medication package's directions. Let's take a look at some common medications that are considered safe, as well as some that are not safe for use during pregnancy. Medical doctors recommend women take Bendryl for allergy relief during pregnancy. Antihistamines are generally considered safe to use, so medications such as Claritin and Tavist are recommended. Medical doctors recommend women take Acetaminophen, Sudafed, Dristan and saline nasal spray for cold and flu symptoms during pregnancy. Pregnant women should not use Aspirin at any point in their pregnancy. Ibuprofen and Naproxen (Aleve) should be avoided. Combination cold medications generally contain chlorpheniramine, which should also be avoided. Avoid pseudoephedrine and phenylephrine, which are both decongestants. Medical doctors recommend women take Robitussin DM, Vicks cough syrup or Halls cough drops for cough relief during pregnancy. Pregnant women can safely mix honey with warm water, which will coat the throat, providing temporary relief. If these do not treat your symptoms, contact your healthcare provider before seeking additional relief. Avoid cough medications that contain alcohol. Medical doctors recommend women take Metamucil, Milk of Magnesia, Colace, Fiberall and Citrucil for constipation relief during pregnancy. Increasing the amount of fiber in your diet will also help prevent constipation. Medications that contain bismuth subsalicylate, such as Pepto Bismuth, should be avoided. Mineral oil and castor oil should not be used while pregnant. Medical doctors recommend women take Immodium for the relief of diarrhea symptoms during pregnancy. Medications that contain bismuth subsalicylate, such as Pepto Bismuth, should be avoided. Medical doctors recommend women use Neosporin as a first aid cream during pregnancy. Medical doctors recommend women take Acetaminophen, or Tyelnol, for aches and pains during pregnancy. Pregnant women should not use Aspirin at any point in their pregnancy. Ibuprofen and Naproxen (Aleve) should be avoided. Medical doctors recommend women use Preparation H, Tucks pads or witch hazel during pregnancy to relieve the symptoms associated with hemorrhoids. Medical doctors recommend women take Tums, Mylanta and Maalox to relive heartburn, which can occur frequently during pregnancy. Medications that include simethicone can be used for gas pains. Medical doctors recommend women take Emetrol, Emetrex, Vitamin B6 or use Sea Bands during pregnancy for relief of nausea. Medications that contain bismuth subsalicylate, such as Pepto Bismuth, should be avoided. Medical doctors recommend women use Monistat or Terazol to relieve yeast infections during pregnancy.